There is a fundamental difference between Religion and Dharma. Our failure to be conscious of this difference has resulted in the creation of several crucial problems that we, as humans, have faced in this century and continue to face even today. What's in the term 'Religion'? How Religion is different from Dharma? 5. The Dogmas of "Do’s and Don’ts"
Let us talk about Dharma — not religion! In modern day language, dharma is equated, quite unfairly with religion. Organized religion demands adherence of the followers to the Book and the Prophet. Anything outside the boundaries of a faith is considered irreligious, if not downright sinful. It is believed that salvation lies only through the body of the Prophet or His words. History of mankind is often a gory testament of destruction wrought by the zealots in pursuit of faith. It is a testament of dividing people and converting them, of persecution, intolerance and subjugation, or of burning at the stakes: of the contest between the ecclesiastical and the temporal, the doctrine of two swords and of intrigues. Religion has been one of the most potent divisive forces in all history. Dharma, however is different. It is different because it unites. There can never be divisions in dharma. Every interpretation is valid and welcome. No authority is too great to be questioned, too sacred to be touched. Unlimited interpretative freedom through free will is the quintessence of Dharma, for Dharma is as limitless as truth itself. No one can ever be its sole mouthpiece. The Western cultural traditions, on the other hand, are built around religions. The emergence of the nation-state in the 16th and 17th centuries was the product of religious conflicts of the secular State with the Church. Much of what we call modern political vocabulary emerged and acquired meaning during those turbulent periods. Much of this vocabulary was directed at defining spheres - of the individual, of the State, of the Church as well as their inter-se relationship. The concepts of identity, ethnicity and autonomy are the products of this separation between the Church and the State. The emergence of science as a discipline made the issue of identity vis-a-vis religion more acute. Due to the dominance of much of the world by the Western countries, modernity and modernism came to be associated with these divisive concepts that originated in the West. The Western education system forced us to think in Western ways. But more than that Western influence resulted in our resenting our own moorings which were described by the West as backward. We got into the habit of using words and concepts without giving thought to their relevance for the Indian ethos. We attempted to fit ourselves into the strait-jacket of Western ideas and concepts. This resulted in conflicts, chaos and divisions in Indian society. Religion is a set of common beliefs and held by the group of people often codified as prayer and religious law. There are as many different types of religion and there are different types of people in the world. Our principal error, which we continue to make to this day was in not making the distinction between dharma and organized religion. How can that which is cosmic, and thus, limitless ever be compartmentalized and limited in boundaries? How can something which evolved through interpretation by free-will of millions of people ever be handed down in the form of a limited doctrine ideology or value system? dharma shunned all attempts at strait-jacketing. Western culture, on the other hand, was a universe of many strait-jackets. The English word "religion" is derived from the Middle English "religioun" which came from the Old French "religion." It may have been originally derived from the Latin word "religo" which means "good faith," "ritual," and other similar meanings. Or it may have come from the Latin "religãre" which means "to tie fast." Oxford Advanced Learner's Dictionary says that religion is one of the systems of faith that are based on the belief in the existence of a particular god or gods. The New Collins Dictionary gives the meaning of religion as any formal or institutionalized expression of the belief in a supernatural power(s) considered to be divine or to have control of human destiny. Even though the word "religion" has its roots in the ancient Latin, its meaning and comprehension has changed entirely in recent centuries. Thus, today this word is based on a Christian concept and rooted in a Christian background of affiliation which came into use in the nineteenth century. Contrary to this definition, many spiritual traditions especially the Hindu and most Eastern traditions do not share the same concept of religion and its affiliation. It suffers from a general malady – that of using Western terms, categories and worldviews to understand an Eastern tradition. Adopting the Western worldviews and nomenclature to interpret the Hindu tradition has distorted the reality, to the extent that the true meaning and concepts of Sanatana Dharma (categorically termed 'Hinduism' in the narrow sense 'religion') is not understood correctly or often regarded as complicated — not because its teaching and concepts are complex, but due to the incorrect means of understanding. There is a need to appreciate that there is a difference in which religion is looked at in the Hindu and Christian viewpoint. For a Hindu, religion is not a mere ritual, but a philosophy of life. We know that Hinduism does not have a book, a prophet, or a centralized hierarchy. The correct description of Hinduism is Sanatana Dharma. While sanatan has an English equivalent, meaning "timeless", translating dharma as religion is not proper. Dharma encompasses religion. Confusion prevails when dharma is equated with religion. When we begin to understand what dharma is and that it has been a very different concept than religion, it follows then that the concept of a “Hindu” religious identity, if understood in the image of Abrahamic religions is not really an original dharmic concept. Neither is “Hinduism” a religion in the same sense that Christianity is a religion. So how did the term “Hindu” become a religious designation? It was in the encounter with the adherents of two major proselytizing Abrahamic religions — first Islam and then Christianity that the idea of “Hinduism” successively took shape in the form of an Abrahamic religion. Hindus had never known they were "Hindus," yet they had to be happy with this new designation; They had never called their view of the world a "religion" (a word with no equivalent in Sanskrit), but it had to become one, promptly labeled "Hinduism." Nor was one label sufficient. Hindus always recognized and respected the infinite multiplicity of approaches to satyam, the Truth (what is commonly, but incorrectly, called “tolerance”), but under the Western spotlight those approaches became so many “sects” almost rivaling each other (perhaps like Catholics and Protestants !). Hinduism was thus cut up into convenient bits — Vedism, Brahmanism, Vaishnavism, Shaivism, Shaktism, Tantrism, etc. — of which Indians themselves had been largely unaware, or at any rate not in this rigid, cut-and-dried fashion. 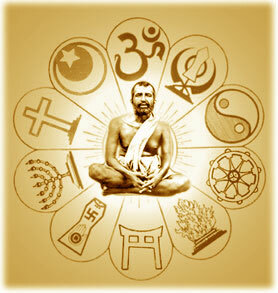 As for Buddhism, Jainism and Sikhism, which had been regarded in India as simply new paths, they were arbitrarily stuck with a label of “separate religions.” Similarly, thousands of fluid communities were duly cataloged and crystallized by the British rulers as so many permanent and rigid castes. 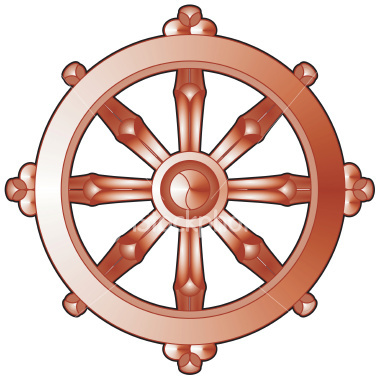 The Wheel of Dharma is translation of the Sanskrit word, "DHARMACHAKRA". Wheel of Life Law. Similar to the wheel of a cart that keeps revolving, it symbolizes the Buddha's teaching as it continues to be spread widely and endlessly. Martineau’s definition of religion appears plausible in the context of prophetic religions like Zoroastrianism, Judaism, Christianity and Islam. All these religions are, broadly speaking, monotheistic — they believe in the existence of one exclusive God. 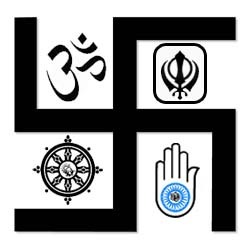 However, if we take into account the religions of Indian origin, namely, Jainism, Hinduism, Buddhism and Sikhism, we find that the definition is too narrow, as it results in the exclusion of Jainism and Buddhism from the list of religions. Even Hinduism does not fit in neatly into the monotheistic model of religion. In fact, among religions of Indian origin, Sikhism comes nearest to the monotheistic model. In case of Hinduism, on the other hand, the situation is much more complex. In Hinduism anthropomorphism (nature-worship), polytheism, monotheism, monism and even atheism appear to be existing side by side. In any case, Hinduism is not a strictly monotheistic religion. Finally, Buddhism and Jainism are religions without God as its central theme. Confucianism and Taoism in China, again not religions in the Western understanding of the word. The idea of being 'religious' is ultimately a Western idea. In the Hindu tradition, there were atheistic and materialistic schools of thought, like Charvaka, all of which get lumped under 'Hinduism'. Obviously, if we take the Abrahmic idea of religion, atheistic religion is absurd — you can't really be a 'Christian atheist' or a ‘Muslim atheist’ — not so long ago you would be hung for heresy. Hinduism is a colonial term for the rich banquet of the dharmic traditions that cannot be combined under the framework of religion. What encompasses Hindu Dharma is a much broader concept than narrow restrictive dogmas that define religions. The so-called religions of India are not religions but ways of cultivating dharma! They are to recognize dharma, the underlying Universal Truths, and to build our life and culture around them. Jaina, Buddha, Sikh etc. are paramparas (spiritual lineages), based on the teachings of one or a several enlightened people. All these teachings spring from the Sanatana Dharma. Saiva, Shakta, Vaishnava etc. are different lineages belonging to the Hindu thought. There are many different rituals, customs and practices in each of these lineages. Some are purely cosmetic, some are superstitions and yet most of them are ‘made easy’ methods for people to live in harmony with dharma. The path of a genuine seeker of Truth is tough one. Everybody cannot travel on this path. Very few people become physicist or biologist who are searching for Truth in their own fields. The rest just use the Truth or knowledge discovered by the formers. Similarly, the Hindu Dharma is developed based on the Truth discovered by rishis for centuries and is collected in many texts such as the Vedas or the Bhagavad Gita or the Yoga Sutra of Patanjali. For ordinary people, different paths are prescribed in the texts as well as by enlightened people like Buddha or Sankaracharya and many others. This over simplistic and crude definition undermines the reality when it comes to defining a profound, diverse and sophisticated tradition such as Hinduism. The Hindu tradition neither has a single founder, a single holy book, an unified method of worship or a centralized hierarchy therefore it defies to meet the same criterion as it is with the Abrahamic religions. It is unfortunate that many times, attempts are made to fit the Hindu Dharma into this model, without considering the fact that the Hindu reality is fundamentally in contrast to these characteristics. That a religion is separative, that is to say, in order to belong to it one must not belong to another. These three notions of religion are not a universal idea and by and large do not express the reality of what are called Eastern religions. For instance, the conclusive and separative notion of religion implies that one can only be a member of one religion or another. In both Eastern and many indigenous societies, this does not hold true. In each of these three ways the notion of dharma, which is the original Indian concept, is very different from the notion of religion. These three notions of religion – conclusive, exclusionary and separative, give Abrahamic religions a hard-edged identity. In Abrahamic religions there has been a strong emphasis on the separation of “believer” and “non-believer” and a religious imperative to move as many people from the latter category to the former. Truth has been conclusively and unquestionably revealed and captured in a book, and those that follow it are the only ones that are on the right path. Quite literally, this means that you are “with us or against us” – that the believers are right and represent the good who are “with God”; and all the others are misguided and are part of the darkness and deprived of any direct access to what is the ultimate good. So dharma itself does not create a religious identity. One's worldly self-identity in the dharmic model derives from one's local community, profession or ancestry, jati or kul, but that identity is not a religious identity, fundamentally opposed to the existence of the identity of the “other” as a manifestation of falsehood. Some definitions are so broadly written that they include beliefs and areas of study that most people do not regard as religious. For example, David Edward's definition would seem to include cosmology and ecology within his definition of religion — fields of investigation that most people regard to be a scientific studies and non-religious in nature. From a dharmic view, in principle there is no conflict between science and religion. In fact, the two fields are complementary. This is because of the understanding that the domain of each realm is well-defined. In Hinduism there are two categories of knowledge, para vidya (the spiritual knowledge) and apara vidya (material knowledge). Scientific knowledge is the realm of apara vidya. Spiritual knowledge — knowledge of God and life — belongs to para vidya. Hinduism points out that scientific knowledge can lead to spiritual knowledge. Religion is generally associated with a belief in something unseen, miraculous or irrational. For many, religion is something removed from day to day life, and it is outside of our known world and also something supernatural. The God is sitting outside of the creation and watching us all the time with the balance of judgement! The fruits of the religious practice are often promised to be gained after death and sometimes based on some kind of fear for the unknown and unseen, and associated with the helplessness of human being. Occasionally believers are exploited by the religious heads or those forces, which use religion for social or political gains. Belief is the basis of many religious traditions, especially the non-eastern ones. The dictionary meaning of the word “belief” is ‘a state or habit of mind in which trust or confidence is placed in some person or thing’ and not necessarily there exists a proof. As a matter of fact religion in the western world is neatly and simply defined as a “belief system” and the belief is called “truth”. There is a “belief” in one God, one prophet and one book of revelation. This is true especially in Christianity and Islam. The right “belief” is said to bring about salvation and the wrong “belief” is supposed to bring about damnation. Such religions are trying to convert the entire world to their “belief”. By doing so they hope to bring about salvation for the entire humanity! These kinds of belief systems can state their beliefs in clear and uncomplicated terms and they often sound more like slogans or stereotypes. These are often appealing to an emotional need for certainty and security. Life is not so simple and eight or ten formulas are too inadequate to solve life’s problems! Why should belief be asserted? Why should any truth have to be imposed as it is done by religions of the world? Does not the truth of things speak for itself if we are open to it? We know that if we protect the earth it will remain as our place for living - we don’t have to ‘believe’ it. Do we have to ‘believe’ that Ahimsha or non-violence is a great virtue? Do we have to ‘believe’ that vegetarianism is good for our health, environment and economy or we know these for fact by experience? We also frequently use another word: Faith. In the dictionary faith has several meanings: ‘allegiance to duty or person’, ‘belief and trust in the loyalty of God’, ‘belief in the traditional doctrines of religion’, ‘firm belief in something in which there is no proof’ and ‘complete confidence’. If faith means an openness of the heart to truth, which looks beyond belief and the aspiration to the truth then it is appropriate. The word faith in many cases is also associated with blind faith. If by faith we mean “complete confidence” then it is fine to use. Faith and truth are not the same. Most religions around us contain three aspects. Within all religions can be found moral principles, which reflect universal ethic and truth. Religion tells us not to be selfish, do good, not to harm others, not to steal, lie or cheat; common human values that all societies require to some degree in order to continue to exist at all. Dogmatism is the second aspect of religion under which certain actions as said to be wrong which may not reflect any ethical or moral values, but only the bias of a particular belief, particularly the belief of the founder or few followers of the founder. For example, if a religion tells us that it is a sin not to perform certain rituals, or only the book of a particular religion has the so-called revelation of God is not a statement of truth but purely a belief, which cannot but lead us to ignorance. The dogma may even tell us that if we did not follow the scriptures or a prophet, one has to go to a place called hell after death and has to suffer eternal punishment. Based on the ethics, beliefs, experiences and the dogma, each such “institutionalized system” or religion introduces of rituals and practices. It may be simply praying in a church, performing “namaj” or doing meditation. Sometimes the rituals may have good value and sometimes meaningless. Religions are said to mix the nectar of ethics with the poison of exclusive beliefs. They add hundreds of do’s and don’ts, and bar logical or rational questioning. These dogmas create disharmony through both the “believers” and the “non-believers”. The believers avoid logic and the non-believers stamp the believers as outdated or unscientific or even fanatics. Do we really need such religions? Should we discard religion altogether and follow secular and universal ethics only? If we have to ask ourselves the question: What is Dharma? We cannot confine the answer to the limits of a definition because the concept of dharma is too big for any definition. So, What is Dharma, in a nutshell? First and foremost it means living in harmony with nature and natural laws. It means to live by moral and ethical principles of the society without surrendering the freedom to question them. The term 'Yuga Dharma' signifies that Dharma itself is continually evolving and not rigid or inflexible. The continuous evolution of Dharma has been through debate, and the triumph of logic, consensus and harmony. Most importantly, Dharma is not linked to any religion or set of beliefs. The Sanathana Dharma, called Hinduism, Buddhism, Jainism and other Eastern ways of life emphasized the right laws of living and did not insist on fierce loyalties to any particular dogma. They are not religions in the English dictionary sense of the term. Sanatan here does not mean ancient. It means ever renewing Dharma, ever fresh with time. Samaya Bhedein Dharma Bhedah. Dharma changes with time. The term "Dharmic Tradition" can be applied to Hindu, Buddhist, Jain, Sikh or any of the ancient Indian faiths that is base its foundation on the principle of Dharma. Dharma is an ordering principle which is independent of one’s faith or methods of worship or what is understood by the term ‘religion’, thus providing for total freedom in the path chosen or ethical norms employed, in an eternal journey from being to becoming. Dharma is a very ancient word. Dharma is non-divisive, non-exclusive, and non-conclusive. Dharma is a quest for understanding cosmic order of the universe and consciousness order at a personal level. ‘Dharma’, in fact, transcended the narrow boundaries of religion. It offered limitless freedom of choice of methods as well as goals. It is inherently secular which can even include those who question ‘Dharma’ itself. It encourages free inquiry and never seeks to confine people into categories and denominations. It is this inherent tolerance and catholicity that enabled people, in the ancient times, to pursue faiths independent of their rulers and vice-versa. The rights and duties of the rulers and the citizens, though never codified were always respected. Each institution of the society, each individual, almost intuitively knew where to draw the line, where to define the limit. Tolerance is, therefore, integral to ‘Dharma’, plurality is inherent in it. This tolerance and plurality do not find space in the concept of religion. Dharma unites. Religion and its obverse secular are divisive. Religion is a restrictive canvas related to modes of worship of a divinity called by a variety of names. Religion and its obverse secular is restrictive in relating to parts of society and parts of social conduct. The Hindu Dharma itself is called Sanatana Dharma. Buddhism is called Buddha Dharma or the Dharma of the Buddha. Jainism is called Jain Dharma. Sikhism is called Sikh Dharma. All dharmic traditions recognize certain fundamental laws or dharma. These include the law of karma, the process of rebirth, and the need to gain release from the ego that keeps us bound to it. They also recognize certain methods of yoga, mantra and meditation to reach this end, which can be called dharmic practices. The Dharmic Traditions of India share the core values of dharma. These involve ethical principles like ahimsa, truthfulness, compassion and renunciation. They require a respect for all life as sacred and a recognition of a single consciousness as pervading the entire universe. The dharmic traditions of India emphasize dharma first and on that basis allow for a diversity of religious beliefs and philosophies to develop. Dharma, therefore, is not an exclusive belief principle, but an inclusive attitude based upon honoring the unity and interdependence of all existence. For example, Buddhists, Jains and Hindus may disagree philosophically on the description of ultimate reality, not only with each other but among themselves, but that does not require abandoning dharma. In fact for them, the supreme Dharma is beyond words and beliefs anyway. Philosophical views and religious beliefs are only tools to develop dharma and if they take us away from dharma, they should be either modified or discarded. Hence, it is truly universal, sanatana dharma, the ordering principle eternal. Since it is an ordering principle, the word is applied across many facets of life, for example to rajadharma as an ordering principle for governance, svadharma as an ordering principle of one’s spiritual quest or life in society or asramadharma denoting responsibilities associated with one’s station in life’s progress from childhood, through studentship, marital life and to old age. Dharma is elaborated with the use of terms such as satyam, rita, rinam, vrata to defining ethical responsibility performed in relation to social and natural phenomena. Dharma can be the defining paradigm for a world as a family, vasudhaiva kutumbakam. Aano bhadraah kratavo yantu vis’vatah. Let noble thoughts flow to us from all sides. These thoughts from Vedic times are as relevant today as they have been over millennia of pilgrims’ progress and exemplified by the progress and abiding continuum of Hindu civilization, Jaina ariya dhamma and Bauddha dhamma. In such an ordering, dharma-dhamma becomes a veritable celebration of freedom, freedom in moving from being to becoming. Now, the question is does such thing as “Hinduism” exist? Since this is not a ‘belief’ or ‘ideas’ of a particular person or a group, ‘ism’ does not fit with it. This name was given by those who did not understand the system and in back of their mind they thought that theirs is the only truth and others are all ‘false belief’ or ’satanic path’! Hinduism is more than a religion, more than the theological direction in which the west understands religion. It is an unbroken spiritual tradition that is founded on the principles of Dharma which is often called Sanatan Dharma. The ideal function of dharma is to provide a sound, fundamental world-view which correctly orientates the individual to the cosmos and thus can serve as the basis for an intelligent guide to living. The relation of Sanatana Dharma to the Hindu system is like science to technology. What does the word “Hindu” represents? According to the dictionary: ‘the inhabitants of India’ or ‘followers of Hinduism’ are Hindus. Simply, Hindu is name of a dharmic system and a culture. How about a “Hindu religion”? Does it exist? How many different “panths” and sects can be found which is based on Sanatana Dharma? And, are they like other religions of the world? Should we adhere to Hindu system as a belief-oriented system? Is it right to call it “Hindu faith”? The answer is simple: If such a belief is necessary for certain individuals it is OK. But a system cannot stand on belief or assumption. It must have a rock solid foundation of truth, facts and logic, and it must be able to accommodate the least evolved person as well as the most evolved one. Its origin cannot be traced to a single person who received a divine revelation and became the founder of the faith. It is not based upon a particular book. It cannot be defined in terms of a dogma or a body of beliefs that distinguishes its followers from the rest of humanity. It does not have an established institution with the power to induct or expel people from the faith. A central institution or authority such as a church or an association does not control it. It is not averse to examine and assimilate fundamentally diverse thoughts and beliefs into its system. It has been evolving continuously, through internal reforms and as a reaction to threats and challenges. Even though there is no central authority that enforces cohesion among its people and lays out plans for the future, its fundamental concepts and outlook have permeated all sections of the society. What are the fundamental notions essential in Hindu Dharma? Recognizes that the greater portion of human religious aspirations has always been unknown, undefined and outside of any institutionalized belief. Allows absolute freedom to the rational mind of man. It never demands any undue restraint upon the freedom of human reason, the freedom of thought, feeling and will of man. It is only a means to an end, and all dharmic means that ultimately lead to the final goal are approved of. Does not force anybody to accept particular dogmas or forms of worship. It allows everybody to reflect, investigate, enquire and cogitate. Gives reverence to individual spiritual experience over any formal religious doctrine. As there is no separation of humanity as believers and non-believers, the need or question of organized conversion do not arise. This attitude finds further expression in the fact that the dharmic traditions tend to be non-proselytizing even when they become missionary. Let us talk about Dharma - not religion. Let us understand Dharma and find out our own Dharma. One may or may not be religious, may or may not believe in God, but can be Dharmic! If we understand this system as an approach to a universal tradition, which shows how truth and spirituality can be integrated into the whole of life, then it can be of great value for formulating a global dharmic culture today. Looking what religions have done to humanity throughout history, one may feel it might be better for us to stay away from religion. It appears that would save us from so many wars, crusades, hostilities and misunderstandings, such as world history is mired with. Open the newspaper today and see how often words like ‘religious fundamentalist’, ‘militants’, ‘terrorists’, ‘bigots’ etc. are used! Dharma is universal, it transcends race, religion, gender and even species. Human beings have the unique ability to follow Dharma or negate it. Negation of Dharma inflicts misery on the planet while following Dharma brings fulfilment to life. The believers have faith in it but almost every moment the do’s and don’ts haunt them and there are always discrepancies between many of the acts of these people and their beliefs. Non-believers want to stay away from ‘authorities’ and seek for ‘freedom’ of thinking and living. Many, especially the students try to avoid religion to enjoy a life without the restrictions put by religion. Some people say: “Religion is opium of people”. Others say, religion is illogical and unscientific. The world, today, is like a melting pot, where principles, handed down by the West as universal, timeless constructs, have failed to provide to the people of the world a cohesive identity. All ideologies have been found to be deficient. Today we need a new dharmic consciousness in the world, a recognition of the universal dharmas of being, consciousness and bliss that unite all creatures. All beings have the rights to exist without interference, to develop their own awareness, and find their own happiness. Much of the global crisis today has come about because we human beings have abandoned Dharma and sought to impose our beliefs and desires not only upon other human beings, but on all of life and nature, subordinating the entire planet to our selfish ends. Unless we return to Dharma, it is unlikely that we can flourish, or perhaps even survive as a species. Restoring and reviving Dharma, therefore, is probably the most important issue today. 1. Need I belong to only one religion?, by Sankrant Sanu, Dharma and Religious identity, Feb 14, 2003, www.sulekha.com. 2. Dharma, the Need of the Hour and of all Time, by Vamadeva Shastri, Global Dharma Conference: Philosophy, 2003.